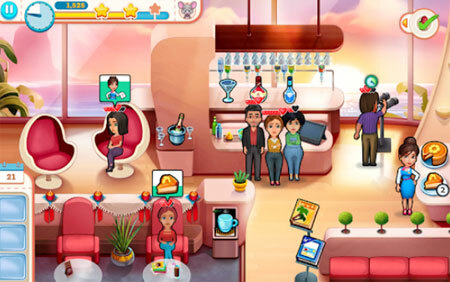 Amber’s Airline – High Hopes is a brand new time management adventure from GameHouse. You’ll get a taste of the glamorous life of a flight attendant. Meet Amber Hope, aspiring stewardess for Snuggford Airlines. Amber has dreamed of flying to exotic destinations around the world since she was a girl. But before she can join the elite crew of air hostesses, she’ll need to pass her exams. That’s not going to be easy, and she’ll need your help. Everything is overshadowed by what happened in her childhood and she can’t escape her past. Her lingering guilt and fear are holding her back from achieving the very thing she is trying to achieve. When her plane crashes, Amber is forced to face her fears. As you’ve heard time and again during safety demonstrations, Amber will have to help herself before she can help others. Fly through 60 travel-themed levels, and 30 extra challenging levels. Explore the world and get a behind-the scenes look at airport life with 6 unique locations. Master 18 mini games that cover every aspect of flying. If you get stuck in the game, check out the video walkthrough and gameplay for the game. This entry was posted in Android Games, iOS Games, Mobile Games, Walkthrough and tagged Amber's Airline - High Hopes Cheats, Amber's Airline - High Hopes Game, Amber's Airline - High Hopes Gameplay, Amber's Airline - High Hopes Guide, Amber's Airline - High Hopes Hints, Amber's Airline - High Hopes Review, Amber's Airline - High Hopes Solutions, Amber's Airline - High Hopes Strategy, Amber's Airline - High Hopes Tips, Amber's Airline - High Hopes Walkthrough by Marvin. Bookmark the permalink.